Without any doubt, Indian wedding is one of the most exotic wedding parties! Indians are very festive. Design styles and costumes burst with many different colors. Although senses are overflown with color and sound, Indian wedding is wholesome. Traditional songs and dances tie the whole party into a harmonious event. A traditional Indian wedding lasts for three days. Rituals of such wedding depend on the religion of the bride and the groom, region of India, local adaptions, budget resources and of course preferences of the bride and the groom. 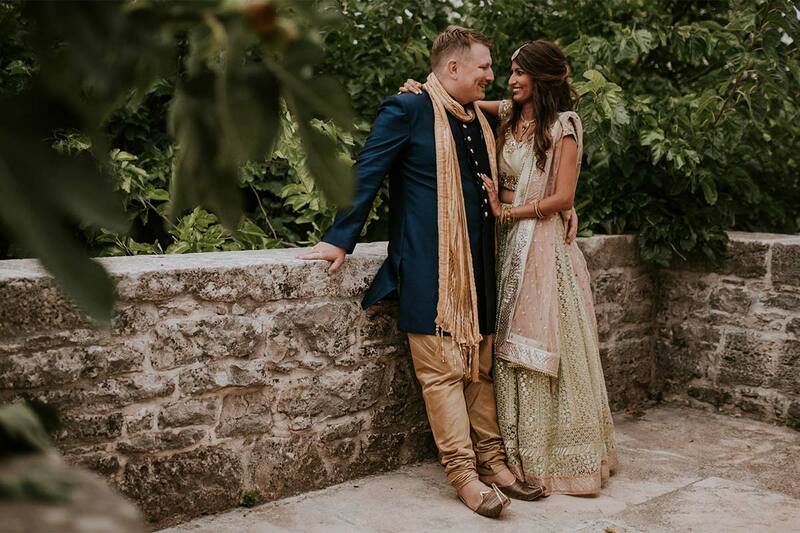 Our newlyweds Naziya and Florian organized an Indian destination wedding in Croatia. It lasted for a few days, but traditional Indian celebration was organized on only one day. The celebration was not held in a classic hotel banquet hall or Muslim Mosque. The celebration was organized at the wonderful family agrotourism in the inland of Istria. Baraat is a procession of groom’s family and friends. In Baraat a groom glamorously enters the venue in the middle of a traditional dance. He usually rides a horse or an elephant. Although Florian initially chose to ride a horse, due to the bad forecast and occasional rain, he decided to arrive in a fancy Mini Morris. Naziya and Florian haven’t let the rain interrupt any of the Indian rituals. Traditional Indian music played during Baraat to announce their arrival. Bride’s sister played pranks and welcomed the guests with flowers and sprinkled rosewater on them, to symbolize the purity and fragrance of the divine. The bride’s mother handed sweets as a welcome gift to her daughter’s wedding. Payment of financial downer by the groom is called Mahr. This marriage gift is considered a divine injunction. By Quran, Mahr is a token of husband’s commitment and responsibility. It may be paid in cash, real estate or movable objects to the bride. On the day of the wedding ceremony, the elder members of both families agree on the amount of Mahr. Nikah is an Indian marriage ceremony ritual. The symbolic Nikah wedding ceremony was performed by an imam. It was followed by a traditional marriage sermon. It involved specific prayers and readings from Quran. After the wedding ceremony, guests enjoyed delicious local Istrian cuisine, adjusted for the Muslim eating rules. The party lasted until the early morning, with the guests dancing to the greatest Indian hits, mixed with the international music. There wasn’t a person in the restaurant who wasn’t dancing and having the time of their lives, including all of the vendors and waiters. Indian wedding clothes are also important parts of the wedding. Naziya and Florian looked amazing in their gorgeous gowns. Naturally, guests were also dressed up in colorful and stylish traditional clothing. Decoration was a significant factor in making the venue look outstanding. It was a real challenge to prepare the venue for the Indian wedding celebration, so everyone could feel like home and recognize the culture as it is. Tables were full of colorful flowers and golden details. The decorator has put a lot of effort into this wedding decoration and has done wonderful work. Flammeum is a wedding planning agency based in Istria. Our services can help You plan a great religious wedding like this. We can recommend You great local photographers, like the studio that shot this wedding. If You’d like to know more about wedding planning, feel free to contact us anytime.